We briefly mentioned here the famous Cast Away movie starring Tom Hanks, Helen Hunt, and Nick Searcy was filmed on Fiji’s Monuriki Island in the Mamanuca Island Group. It was the first movie to be produced by Hanks’ production company. The survival drama flick from 2000 showcases a FedEx employee stranded on a deserted island after a plane crash. He uses the remainder of his plane’s cargo and ‘Wilson’ the volleyball to keep himself sane. Tom Hanks was even nominated for Best Actor in A Leading Role at the Academy Awards for this movie. Monuriki Island is actually just northwest of Castaway Island. Monuriki is only a little over half mile long and the total land area is just about a quarter of a mile! Can you believe more than 100 people on the set of the movie actually lived on the island during production? And don’t get confused but Monuriki is also known by some as “Modriki” and/or “Cast Away Island.” But if you refer to it as “Monuriki,” it may be less confusing for all! The island is not inhabited, even real life, but you can visit it for the day when staying at many of the resorts in Fiji. 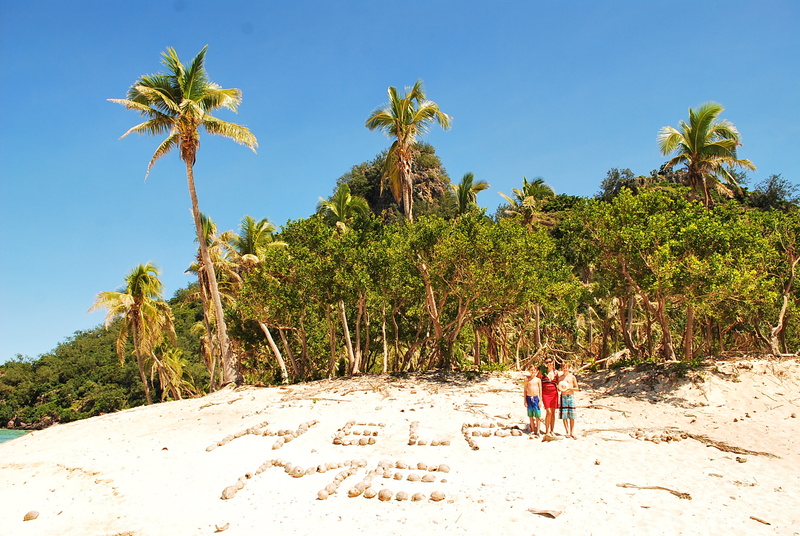 Here are a few Monuriki tours to take in the nearby Mamanuca Island Group. Get whisked away by speedboat to Monuriki with this premium excursion offered by Castaway Island Resort. The excursion includes a champagne brunch, snorkeling, and tour of the sights in the movie. The half-day tour offered by Tokoriki Island Resort is organized through the resort’s tour operator called Tokoriki Diving. The tour offers a half day to help you relive the scenes of the movie Cast Away (if you haven’t seen it, you can get it from the resort!). Once you arrive on the island, you will explore by foot with a helpful guide that talks about the making of the movie and takes you to key locations. After the tour of the movie scenes, you will get to snorkel, swim or relax on the beach in Monuriki’s marine reserve. A marine guide will be in the water to point out aquatic life and help beginners! Finally, you’ll cruise around the gorgeous coastline of Monuriki and Monu Islands. And you are in for treat because they are two beautiful islands. Matamanoa Island Resort takes travelers on Tuesdays and Saturdays on a two-and-a-half-hour tour leaving from the resort. You’ll not only see the set locations of the movie, you’ll also learn about the local flora and fauna, including the Crested Iguana. There will also be time to snorkel or lay on the beach before returning to the resort. During the free time on the island of Monuriki, find some fresh coconuts to drink, relax on the white sandy beach, and snorkel in the reef. For the divers, visibility often runs beyond 150 feet, so there’s excellent visibility. The reef is just magnificent and the sea life spotted includes reef sharks, turtles, eel, barracuda, parrot fish, and more. The water is also pretty easy to snorkel (for the beginners out there) because the coral and reef fish are not too far from the beach. Oh and don’t forget to take a selfie near the “HELP ME” coconuts. Stay tuned next week for Fiji and your favorite television series!